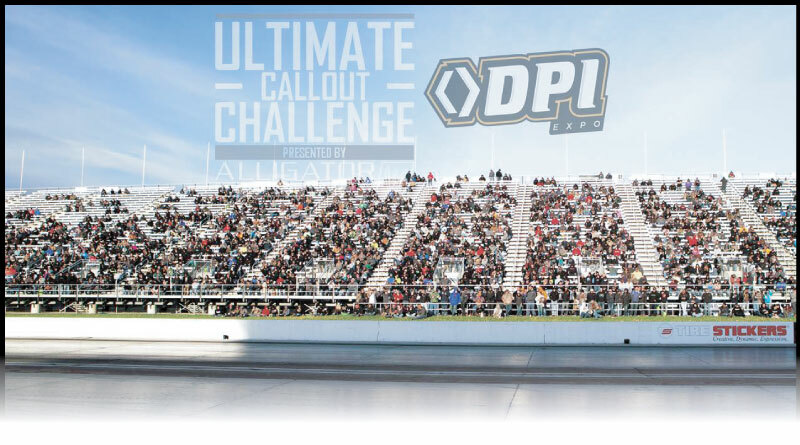 Another year in the books for the Ultimate Callout Challenge and the DPI Expo. The 2016 Ultimate Callout Challenge brought more diesel industry professionals (distributors, manufacturers and dealers) together in one location than any other event outside of SEMA on the West Coast. In 2017, it only grew with over 10,000 spectators present, 112 exhibitors and millions more online. The UCC was once again a success. Securing its self as the largest diesel industry event of 2017, we expect 2019 will continue to break records with attendance, exhibitors and social media. Attached, you will find several sponsorship options for the Ultimate Callout Challenge and DPI Expo. As an exhibitor of the DPI Expo you also get to be a sponsor of the Ultimate Callout Challenge, which we expect to attract an additional 8,000 to 10,000 spectators over last year. The DPI Expo and UCC will both be held at Lucas Oil Raceway in Indiana where the drag, dyno, sled pull events and DPI Expo will all be held in the same location. While the UCC brings in enthusiasts and industry professionals, the DPI Expo is geared towards bringing our industry’s leading manufacturers and dealers together in one place. In addition to the large turnout we are expecting, we also have already received commitments from Diesel Power, Diesel World, and Diesel Tech to be media sponsors. Each publication will not only be there covering the event for the magazine, but will also be promoting it through their websites, social media and other means that they have to engage the diesel fans. We are confident that the Ultimate Callout Challenge and the DPI Expo will once again be a huge success next year and will only double in size. We encourage your participation and hope to see as many of you as possible at this exciting event where the who’s who of the diesel industry will be present, both manufacturer and dealer alike. We will be teaming up again with Alligator Performance as the official title sponsor and official retailer of the Ultimate Callout Challenge and Premier Performance Products as the official WD of the DPI Expo. All sponsorships should be handled through the DPI Expo directly. Please handle payment and booth plotting through James Brendle (208) 520-4965 (JamesB@NorthwestDynoCircuit.com) or Chris Searle (208) 709- 9423 (Chris@dpiexpo.com). We look forward to your partnership in both the Ultimate Callout Challenge and the DPI Expo May 3rd, 4th, and 5th, 2019. As always, do not hesitate to reach out with any questions that you may have. Diesel related products except as otherwise approved by show management. No product may be displayed without the endorsement of show management. Exhibits, which are of a disruptive, objectionable, or inappropriate nature, as interpreted by show management, will be removed from the show. Exhibitors arriving for set-up after their scheduled installation time can be relocated to any location specified by show management or, if no alternative is available may forfeit their show participation rights. Exhibitors must be paid in full before they are allowed to move into the show. Credits may be applied by the exhibitor to any DPI Expo and UCC, show, but must be used within 12 month’s of written cancellation. For all exhibitors requesting a space reduction, DPI Expo and UCC, reserves the right to relocate the exhibit or reconfigure it as determined by the show management. Management reserves the right to limit over-the-counter sale of products for delivery at the show to designated areas. Exhibitor, without regard to assignment, lease, sublease or dealer occupancy shall indemnify, hold harmless, defend or reimburse the DPI Expo and UCC, and its partners, and their managers, Board of Directors, officers, agents or employees from all losses, claims, liability, damage, actions, judgments recovered from or assessed against exhibitor or above named indemnity, plus expenses including, without limitation, attorney’s fees and or use by the exhibitor, or other persons in connection with the show, or the use of the space, such indemnification shall not be effective in damage or injury resulting from the sole gross negligence or willful misconduct of the show sponsor, employees, expenses for any injury to or death or any persons, or any loss of, through theft or otherwise, or damage to property arising in any way in connection with the use and enjoyment by the exhibitor, or of any other person or entity, with the permission, express or implied, of exhibitor of the space, equipment or the show space of hall; arising from the use equipment, devices furnished to DPI Expo and UCC, and its partners, or any of its employees. DPI Expo and UCC, and its partners, shall have no liability whatsoever for any matter or thing resulting from strikes, lock-outs, fire or other acts of God; preventing exhibitor’s show space from being made available to exhibitor. In such case, DPI Expo and UCC shall return to Exhibitor payments made by Exhibitor after deducting therefrom a prorated share of expenses incurred in connection with said show. DPI Expo and UCC, and its partners, shall not be responsible for any loss of or damage to any property of the Exhibitor for any reason, including theft, unless such loss or damage is caused by gross negligence of DPI Expo and UCC, its partners, or any of it’s employees. Exhibitor is required to follow and use any of the security arrangements made by DPI Expo and UCC, for property and valuables when the show is not open. In addition, exhibitor is required to provide and keep in force during the show period, including move in and move out periods, the following insurance coverage: Worker’s compensation and employer’s liability insurance covering its employees in the state in which the show is being held, in accordance with the statutes, rules and regulations promulgated by that state’s governing authorities. Comprehensive general liability insurance, including blanket contractual liability insurance naming DPI Expo and UCC, and its partners, as an additional insured, with limits of $1,000,000 combined single limit for bodily injury and property damage or commercial general liability insurance naming the same as additional insured with limits not less than $2,000,000 general aggregate, $1,000,000 products-completed operations aggregate, $1,000,000 personal and advertising injury limit and $1,000,000 each occurrence limit. All risk property insurance covering all exhibitors property brought into or used in connection with the show, including move in and move out periods, with insurance coverage to be set forth in an insurance policy that includes (A) a waiver of subrogation against DPI Expo and UCC, and its partners, it’s members, employees, officers and agents, and (B) limits of liability providing minimum coverage (with no deduction or participation provisions) of not less than the full replacement cost of the property lost or damaged. Certificates of insurance shall be furnished as soon as possible to DPI Expo and UCC, and its partners, if requested by show management prior to or following the show. Exhibitor hereby assumes all costs and expenses arising from exhibitor’s or exhibitor’s agents’ or exhibitor’s employee’s incorporation or use during the event of any music, written material, dramatic rights, inventions or devices that are subject of any copyright, trademark, trade-name, patent, franchise or other contractual or statutory protection. Exhibitor agrees to indemnify and hold harmless DPI Expo and UCC, its partnerships, its officers, agents and employees from any claims, damages, cost or expenses, including legal fees, which might arise out of or in connection with such incorporation or use. The show management shall have the full power in the interpretation and enforcement of all terms, rules and regulations and any further stipulations considered necessary for the proper conduct of the show. Exhibitor agrees to comply with such terms, rules and regulations. Exhibitors’ failure to comply with such terms, rules and regulations shall entitle DPI Expo and UCC, to terminate DPI Expo and UCC obligations under this contract. Exhibitor agrees to comply with all pertinent laws, codes and regulations of municipal or other authorities, which affect the show space. Drawings, guessing games and prize contests of any kind sponsored individually by exhibitors are subject to prior approval by show management. Kepp up to date on all the details.